While you may not recognize it, productivity can suffer when your concern for others masks your own needs. Ignoring the needs of other important people (or tasks) at work or home. In Anita’s case, fatigue and stress cause performance slippages and present the specter of illnesses. Although being the caregiver rests on the shoulders of many women, men, too, share the burden with similar consequences of health problems due to stress burnout and financial hardships. On an airplane, the emergency instructions are clear: “Put the oxygen mask on yourself before you help others such as children or the elderly.” On the ground, as you are managing multiple responsibilities, you might not see how much caregiving can erode your ability to take care of yourself and your productivity. Although we may have training for a profession or a hobby, most of us have no knowledge or training for caregiving others. It is, therefore, not surprising to experience stress and strain when there is an unexpected or long-term illness or disability. You can maintain your productivity by maintaining self-care, delegating, working with others and seeking expert advice. Learn the signs of caregiving stress or burnout. Remember, you may not even be aware how much it’s affecting your health and work performance. Stop and assess. Reach out to community organizations. For example, use websites such as, The National Alliance for Caregiving, Caring.com, and the Family Caregiver Alliance. The Alzheimer’s Association also offers many services, including online communities, nationwide support groups and a 24-hour helpline. Consider one or several sessions with a social worker or counselor familiar with the illness. For example, most Cancer Centers have social workers familiar with problems associated with symptoms and treatments of cancer. This relieves some of the emotional tensions and provides additional resources and strategies. Build a team. 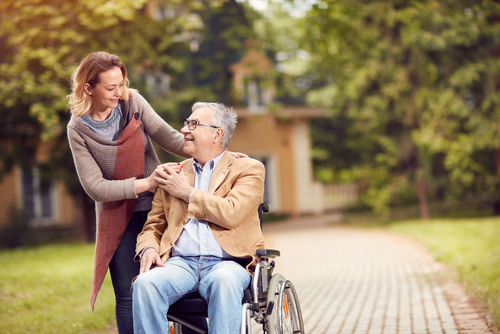 Often caregivers assume all the responsibilities without asking for other’s help. Family and friends will help and once asked, will provide rides, meals, and calls for insurance or medical issues. Also, say yes, if some asks to help you. Keep a journal. Writing about and assessing the situation puts you in a better position to accurately assess fatigue and to gain advice from experts or support groups. Schedule times for exercise, rest, and, recreation. You may be efficient about making time for medical or therapy appointments of others, but never schedule time to take care of yourself. Set realistic goals about what you can and can’t (or shouldn’t try to do). It is important for you to know your strengths and limits. This helps the problem solving and decision-making about hiring additional services. What you can do in the short-run may not be feasible for the long haul given a serious or chronic illness. Take care of your spiritual needs. For some, touching base with religious or spiritual supports is useful. Consider respite care. You may need to get away from it all to refocus and re energize. Build in time for family humor and good times. As they say, “Laughter is the best medicine. Caregiver stress can be managed. Using these ten tips as a reference, you’ll most likely find resources you never thought possible to ease the strain. Don’t allow overwhelm, just take a step at a time. You can learn to stay in balance and maintain your productivity while you are engaged in caregiving activities.